Wooly fur; golden fur on head, neck, shoulders, and sometimes back. Dark brown fur elsewhere. Black wings (not furred). Most of Rodrigues Island's endemic forest is gone. Recognized as Endangered by the U.S. Fish and Wildlife Service. Many changes in populations since the 1970s. Possibly 4,000 individuals, ca. 2003. Most active at dawn, dusk, and at night. Strongly colonial and gregarious. Males defend harems of females. Fruits and flowers, like all Pteropus species. Historically, tamarind pods and mangos were favored foods (humans cut these trees down). Some reports of eating insects. Rats and mynah birds. May not be well documented. © 2010-2019 San Diego Zoo Global. Population estimates and IUCN Status updated Feb 2019. Husbandry information updated Mar 2019. Thank you to Todd Ryan for sharing his knowledge of bat husbandry for the Managed Care section of this fact sheet. 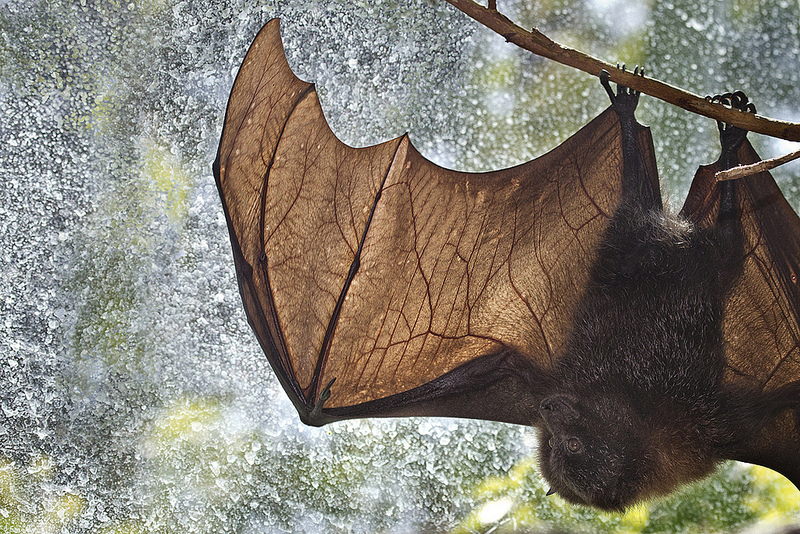 Todd Ryan, Senior Keeper at the San Diego Zoo Safari Park, has provided care for Rodrigues Fruit Bats since the Nairobi Village Bat House opened in 2011. He has worked as a mammals keeper at the Safari Park for 12 years and previously worked in animal husbandry at SeaWorld (San Diego) for 10 years. Mr. Ryan is part of the team that cares for the mammals of Nairobi Village.